This week's focus is on Blue Moon. Doesn't this remind you of a story your mother read when you were a child? 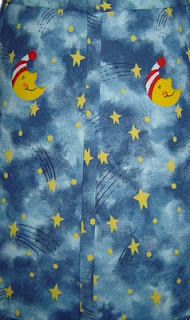 Blue fabric background sets off the blue moon and stars on this hardback shade. The blue base is a light weight acylic. 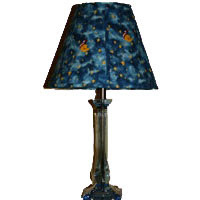 The lamp is 21" high and turns on with a turn switch on the socket which uses a 40 or 60-watt light bulb. It has a six foot gray cord. It is for sale on my website for $45 plus shipping.